Come on down to show some real athletic diversity! We start off in the water with a 2.8k kayak (roughly 20 minutes) circling the main island of Gibraltar, followed by a 5k run touring the Gibraltar's Lake Erie waterfront and canal-front residential areas. Please note that prices increase after May 4, 2018. Registration available until the morning of the race. Speeches begin at 9:00am followed by the start of the Kayak portion of the race. Kayak and Life Jacket rental available. Here is the course map for the Kayak and Run/Walk. 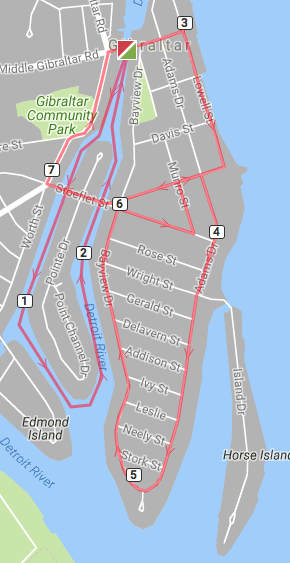 The course for the run/walk may change a bit in order to get the correct distance to be USATF Certified.